The Common Yellowthroat is native to New England, and this design features a female recognizable by their taupe and yellow feathers- rather than the male which is bright yellow with a black marking on the head. Common Yellowthroats can often be spotted during spring and summer, usually in marshes. The male’s call is a "wichety-wichety-wichety" song, which they sing frequently during summer. 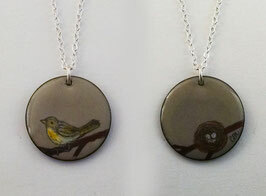 This design features the Potential series theme narrative on front and back sides, with a female Common Yellowthroat on the front and a nest with eggs on the backside. All designs are hand painted and drawn on enamel and fired into the glass, preserving the drawing. This pendant comes on sterling silver chain in your choice of length: 16" or 18". This design features the Potential series theme narrative on front and back sides, with a female Common Yellowthroat on the front and a nest with eggs on the backside. 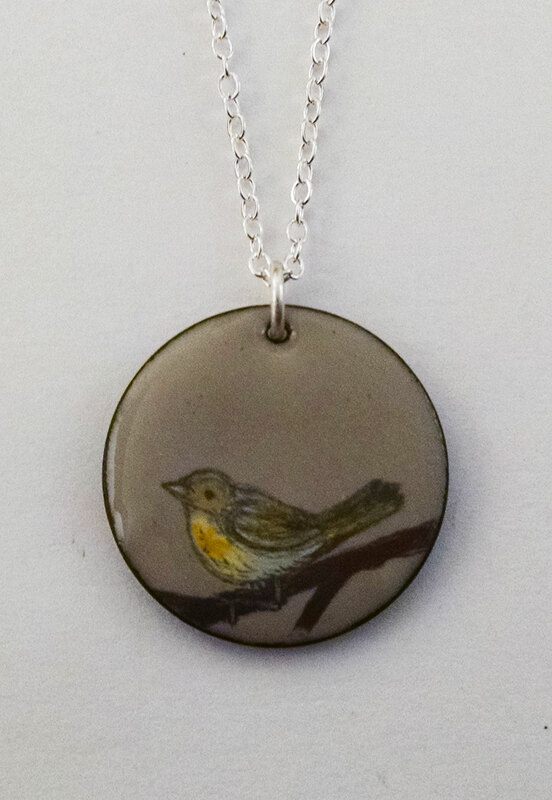 All designs are hand painted and drawn on enamel and fired into the glass, preserving the drawing. 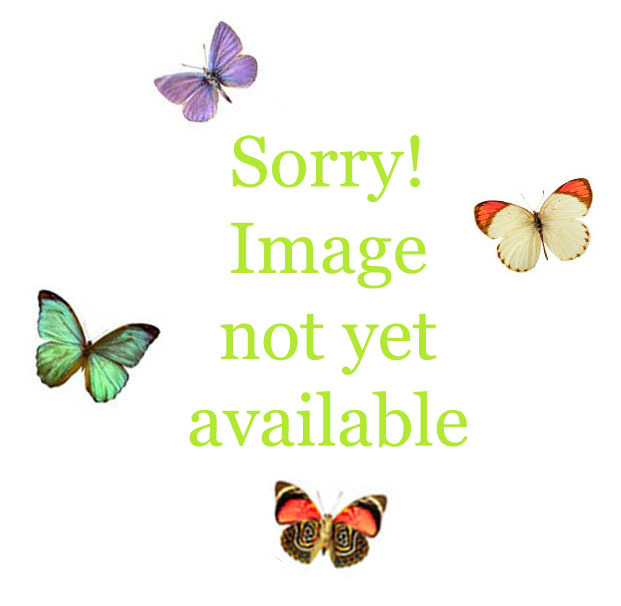 These earrings come on Sterling silver earwires that come with clear rubber earring backs to prevent loss of earrings. 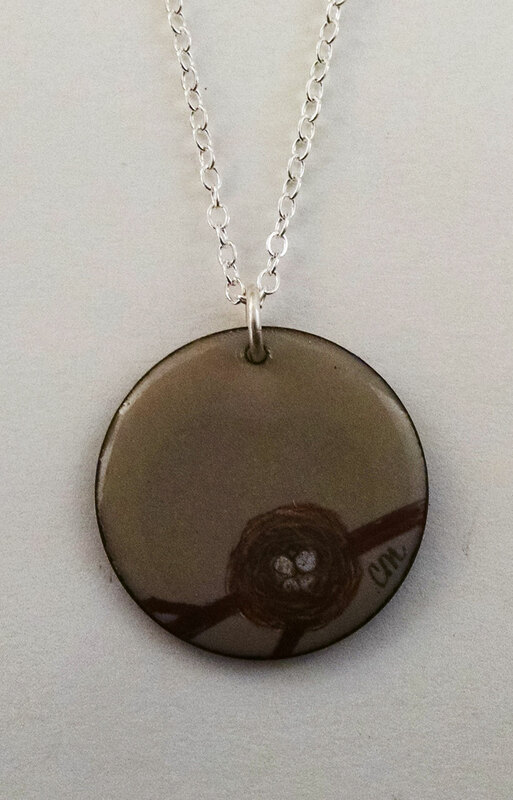 This design features the Potential series theme narrative on front and back sides, with a female Common Yellowthroat on the front and a nest with eggs on the backside. 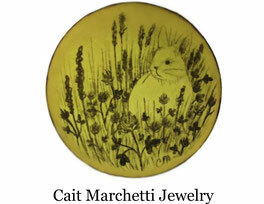 All designs are hand painted and drawn on enamel and fired into the glass, preserving the drawing. These earrings come with sterling silver earwires and clear rubber earring backs to prevent loss of earrings.